Mobile containers in the pharmaceutical industry are often used to store or transport products or pre-products. RFID identification systems are very well suited to ensure correct assignment of shelf life and cleaning intervals. The information on the data carriers can always be retrieved during transport and at the target location and can be read for production safety or control purposes. 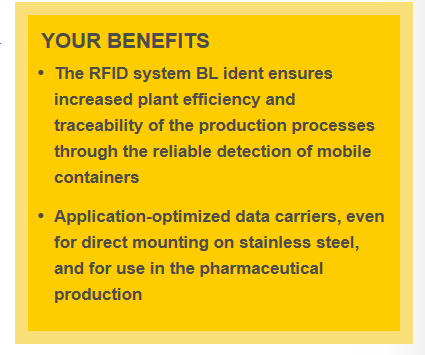 The RFID system BL ident by Turck includes many types of write-read heads and data carriers – also in IP69K or for explosive areas.